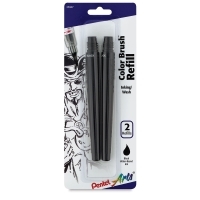 A convenient, portable alternative to traditional brushes and refill cartridges, Pentel’s Color Brush Pens are filled with brightly colored, waterbased, liquid dye ink that dries quickly. They feature a flexible nylon tip that produces a variety of lines, from fine detail to broad sweeping strokes. Ideal for stylized design work, oriental artwork, calligraphy, cartoons and for creating translucent watercolor effects. Pens are valve-activated for a smooth flow without leaking. Color Brush Box Set — Includes three Color Brush Pens, in Black, Sepia, and Gray, and one Aquash Water Brush. Equipped with a medium tip, the Aquash Water Brush features a durable nylon tip and a soft, easy-to-squeeze barrel with a unique flat profile that keeps it from rolling off surfaces. ® Pentel is a registered trademark.™ Color Brush is a trademark.